People often tell me that they have good days and bad days. I always correct them and tell them that there are only good days and better days. I guess that is the optimist in me. 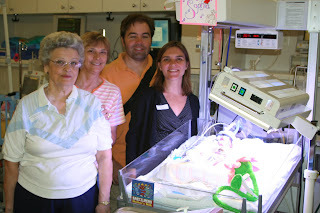 Mari was discharged from the hospital today and got to enjoy the outside world for the first time in over 10 weeks. Only the strongest woman can hang like Mari has. We finally did one of our favorite things tonight - eat dinner outside. We made the very short trip down to Rice Village and grabbed a bite to eat - anything that is not hospital food does the trick - and enjoyed a beautiful evening dining al fresco. In the NICU, today was a good day. 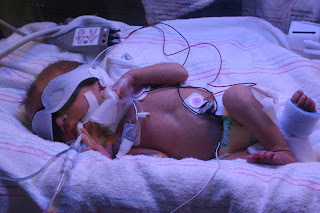 They are now putting the isolette on "manual mode", meaning that Cohen has to maintain his own body temperature. The isolette will only heat up if his temp falls below a certain point. If he is able to do this, he will be transferred to a crib. He is now only on breast milk and has no more IV fluids. Both Finn and Sophia are breathing much better and getting stronger every day. Sophia's bilirubin levels are dropping with the UV therapy (Noah's are as well) and the nurses predict she will get off her CPAP very soon. They also think Finn will be ready to go CPAP-less soon. Our biggest concern today has been Noah. Because the Goerlich boys tend to mess up their IVs, they put in a central line today. When they did the Xrays this afternoon to check the placement of the central line, they noticed that the folds in his intestines are dilated. Remember, he has not been able to eat yet. They did another set of Xrays to get a 2nd look and both the radiologist and the pediatric surgeons think Noah has an obstruction or stricture in his intestines not allowing him to eat. They plan to do a barium enema followed by Xray tomorrow to get a better look at what's going on. The surgical resident said she is 98% certain they will do surgery on Tuesday or Wednesday to correct the problem. Obviously, we are concerned and scared about our little one having surgery already. Mari is really having a hard time with this situation and is just totally stressed, understandably. Please rally in prayer around Noah and Mari over the next several days to lift them up and give them strength to persevere. Auntie C noticed today that the babies have my ears - mine are the same size as theirs!! The first part of Psalm 28:7 says "The Lord is my strength and my shield; my heart trusts in him, and I am helped..." Keep trusting Him. Will keep Noah in prayer, and you too, for this situation. I know God is holding tight to all of you. We are so glad to hear you all are doing well. We are keeping you all, especially Noah, in our prayers today. Keep clingin' to the Scripture and God's promises. He is faithful, be STRONG and COURAGIOUS! 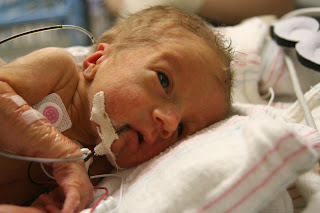 Our little guy Clark (Baby C of the bunch) had a similar situation a few times in the NICU, but did not require surgery, so we are at least familiar to the terminology and the fears associated with this situation. Let us know if we can be of any encouragement to you. We are going to our Heavenly Father on your behalf this afternoon. All of you are in our thoughts and prayers, not just today but everyday. Christopher prayers "for all the babies" every night, and as my family has witnessed this summer, the prayers of children reach Jesus quicker and are answered faster. Keep the faith and love strong in your hearts and believe. What a wonderful job you two have done getting the babies this far. You both have the strength and faith to be there for them now. They are beautiful, and what they are going through now is to be expected for ones so fragile. Keep the faith and know that many, many people are praying for your family and for the health of Finn, Noah, Cohen and Sophia. Take care of yourselves, so you can be strong for them. They need you. Can't wait to see them in person and hold them to our hearts. God bless you all. I was just thinking about the six of you tonight. God is so good and bestows His bleesings on us daily. I will keep praying for you both and all of the babies. I hope the results on Noah can back today!! I will say a special prayer for him. I will keep reading for updates--thanks for posting them!! I have been praying for strength, faith and good health in all your days to come. I look forward to your daily blogs and want you to know ya'll are an inspiration. I'm in awe of all you have gone through! Please let me know what I can do for any of you. Chris and Mari - Many prayers were said for you both and the babies, and I know they will be heard. It's been such a joy to share in this with you with your pictures of your beautiful babies. Feel all the love coming your way from all of your friends and family, and all of those we have shared your story with. Hey Neighbors - Your children are beautiful! We think of your family every day and send up our prayers. After all of this the "Terrible Twos" will be a breeze! Lots of Love!